This tent can be customize as per event requirements with size, colour and prints. 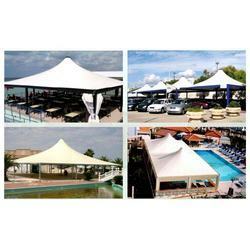 Description : Manufactured from graded cloth material the tent can also be used for longer period at various occasions. They are very attractive and available in various colors, designs. This product has been sourced from best fashion trends for decoration purpose in the market. We are introducing new range of tents for your resort. We are offering Double Layer Outdoor Tent. Foldable tent in powder coated Aluminium frame and Oxford fabric. Very rugged and can be moved around. Usage: Wedding, Function, Product Launch, Events, Exhibition, Shows, Arenas, etc.